Hello Fabulouses 😉 In this blog entry, I’ll be sharing news about a free fatpack of hair by Truth, a couple of 10L finds at The Wash Cart Sale and some items priced at 50% off at Petite Mort! The Hair… I always start with the hair! Astra by Truth is available as a FREE gift in a full fatpack of colours and includes the stylist HUD that allows you to make a few changes to make this cute “do” your style! Astra was a previous release so you may already have it in your inventory, but has been updated with the new colours and stylist HUD options! You’ll find this free hair gift priced at 0L at The Shop Your Heart Out Event Truth display along with some really great half price sale items. Additionally, the hairstyles that they have on sale for the event is also on sale in their marketplace store! The other day, I shared news about a big moving sale [HERE] at Petite Mort/Oublette and I am wearing more half price finds again today. I can’t help myself – I am a huge fan of this boho casual style. You’ll find the Chiffon Halter Top, BF Jeans and Moto Jackets all priced very affordably at 50% off until February 19th! Sometimes to complete an outfit, you need to add a little something extra, and today I am showing off a couple of accessories you can pick up at The Poeme display at The Wash Cart Sale for 10L a piece! The Pueblo cross body fringed suede bags are available in ten different colours and the Dangle Earrings in seven! The Spring Is In The Air Event on The Wash Sim where everything is just 10L is ending on February 14th… which is tomorrow! If you haven’t had a chance to check out what the participating designers have for you, make sure to make some time for it today! Categories: accessories, events, Free, hair, jewelry, mesh, shirt | Tags: 0L, 0L gift, 10L, 10L cart Sale, 10L sale, Catwa, DeeTaleZ, fab free, fabfree, fabulously free in SL, free hair SL, Ikon, Le Poppycock, Love Trill, maitreya, Mandala, Petite Mort, Petite Mort 50% off, Petite Mort Moving Sale, Poeme, Second Life, Second Life Free, second Life free hair, Shop Your Heart Out Event, sl, sl event, sl free, SL Freebies, sl gift, SYHO, SYHO gifts, The Last Forever, the wash, The Wash Cart Sale, TRUTH | Permalink. I have never looked that hot while running errands! I apparently need to step up my game. lol Great post and the boho is perfect! lmao Georgia! Love Trill would stick out like a sore thumb in Walmart. 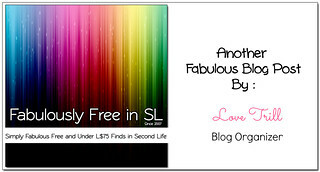 Our tagline on this blog has been “Simply Fabulous Free and Under L$75 Finds in Second Life” for over five years now. In my post there are four really nice items under the 75L mark including a free fatpack of hair. The free items in our blog posts are clearly marked in bold red so that the readers that are just looking for free things, can find them easily.